OMG! 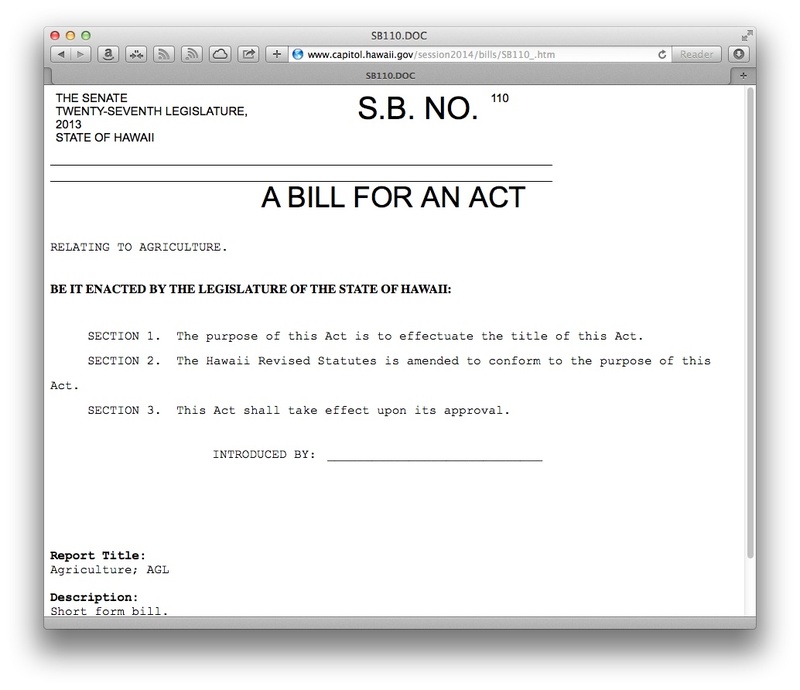 Blank bill becomes "Hawaii Monsanto Protection Act" before my eyes! 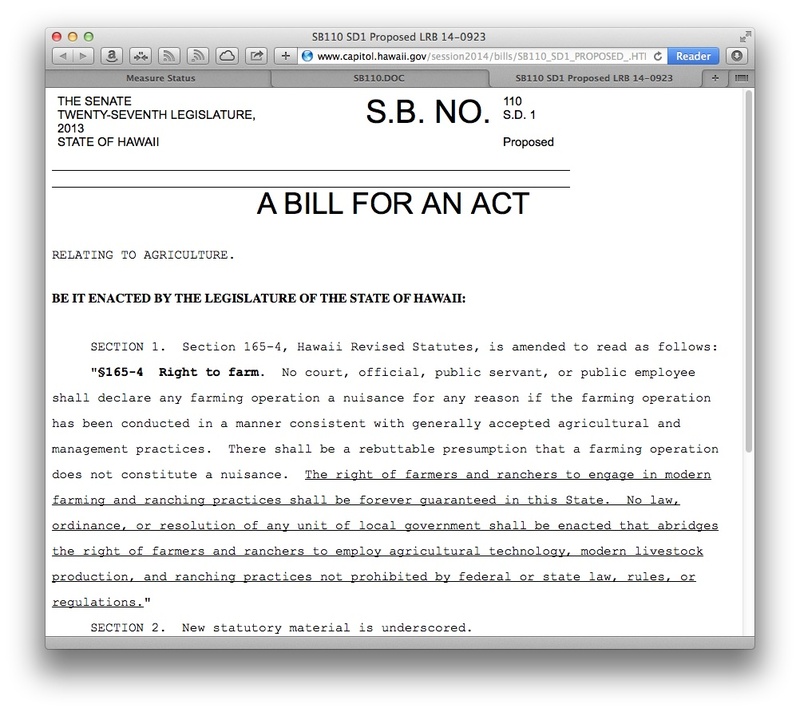 So Iʻm sitting at my computer this afternoon frittering away my life on Facebook as usual when I get some kind of notification of a legislative "sneak attack" at the state capitol on the newly enacted Kauai and Hawaii County ordinances regulating pesticides and GMOs. Aside from two bills already dubbed Hawaiiʻs "Monsanto Protection Act," another has been stealthily introduced and scheduled for hearing tomorrow! Haha. False alert. You know how crazy and emo these GMO people get. But the alert gets propagated all over the place and I figure, letʻs do everyone a favor and put the rumor to rest. No need wasting time, energy, transportation (bus or gas, and downtown parking!) for nothing, right? So I look at the bill status page again to get a reference URL link. The language is clearly aimed at the recent ordinances from Kauai (Bill 2491) and the Big Island of Hawaii (Bill 113) which regulate GMO and pesticides. The giant GMO chemical corporations have already filed suit on Kauai to protect their right to spray pesticides next to schools and residences. This bill (and SB3058) trades protecting the community for protecting chemical corporations. "No law, ordinance, or resolution of any unit of local government shall be enacted that abridges the right of farmers and ranchers to employ agricultural technology, modern livestock production, and ranching practices not prohibited by federal or state law, rules, or regulations." I want to know: (1) Which legislator slipped this language in and scheduled it for hearing; and (2) who called the lobbyists who are sure to be there. If I can, Iʻll livestream this. Hearing is scheduled for 2:30pm and if it isnʻt livestreamed on Olelo, Iʻll make an attempt from my Livestream channel. And note, the new bill language says - FOREVER. Crash and Burn: GMO Bill SB110 "Sneak Attack"